Downtown Arlington features a free yearlong music festival that showcases some of the best musicians in the country and some of the newest musicians just beginning their paths to musical stardom. The Levitt Pavilion for the Performing Arts is a non-profit organization that produces about 50 free music events on the lawn of the Founders Plaza, a beautiful city park in downtown Arlington. There is something for everyone, from jazz to world music and from Texas country to hot Indie. Many of the artists are Grammy Award winners. The Children’s Concerts have fun, interactive shows in which artists teach their young audiences about creativity, self-esteem, the world around them, and even concepts like good manners. Each concert also provides an opportunity to meet neighbors and friends or to have a picnic and enjoy an evening under the stars. 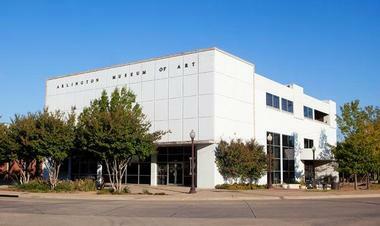 The Arlington Museum of Art is located in the remodeled JC Penney building that first opened its doors in 1989. It is a non-collecting museum that focuses on presenting exceptional quality exhibitions and shows that will inspire, challenge, and inform all visitors, both local inhabitants and tourists. Originally focused on Texas Contemporary Art, the Museum has broadened its vision to include other culturally important and historically significant exhibitions. The Museum organizes educational programs for children and adults and offers practical learning opportunities related to art. The Museum also supports local schools, universities, and other learning centers in areas of art education. 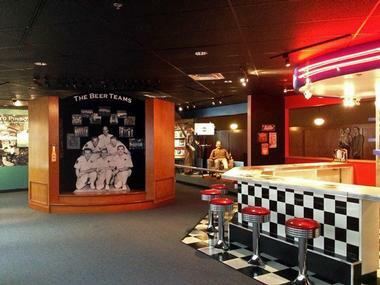 The Museum facilities can be rented for various special events. AT&T Stadium is the home of the Dallas Cowboys, but it is also a fascinating architectural masterpiece and an enormous art gallery. 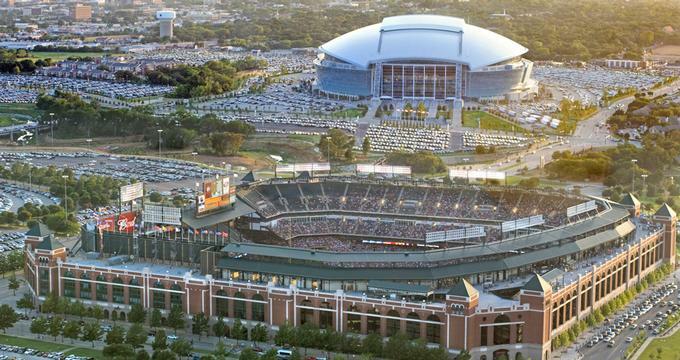 Whether you are a Dallas Cowboy fan or not, a tour of the stadium is an exciting and fun way to visit this extravagant, gigantic temple to football. The most popular way of exploring the stadium is through a self-guided tour. You can go to the field, run around, throw some passes, and take a few photos to show your friends. You can also get a glimpse of the Cowboys’ locker room and even the cheerleaders’ locker room, while they are empty, of course. The interview room and the Miller Lite Club are also open to public when not in use. While strolling through the stadium, you can see enormous paintings that are part of the AT&T art collection and were selected or commissioned by the Jones Family. There are 56 pieces of art displayed all over the stadium, offering the public a unique way to encounter contemporary art. A guided Art Tour of the Stadium offers more in-depth explanation of the various pieces. Globe Life Park is a magnificent state-of-the-art open-air ballpark. This 48,114-seat baseball-only facility is home to the Texas Rangers and a 270-acre complex that includes an office building, a 12-acre lake, and many parks and spaces for recreation around the stadium. Public tours of the stadium will allow you to see the behind-the-scenes features of the ballpark, including batting cages, the dugout, the press box, and the City of Arlington Suite. Pre-game tours will give you access to the ballpark during the team’s batting practice and warm ups, which you can view from the Commissioner's Box. There are also private tours and field trips for schools. All tours start at the First Base Box Office on the south side of Globe Life Park. Mariano’s Hacienda is packed on most days, but when there is a big game at the Globe Life Park, it nearly bursts at the seams. The restaurant’s cheerful Mexican décor, large communal tables, the aroma of succulent grilled meat and Mexican spices get everyone’s juices flowing. The menu features classic favorites whose portions are generous, and everything is delicious. You will find tamales, fajitas, and enchiladas filled with succulent beef or chicken. The margaritas at Mariano’s are legendary. If you are coming with a group of friends, you might want to try the Whole Enchilada, an enormous 20” platter of a beef enchilada, spicy chicken enchilada, cheese enchilada, beef taco, soft cheese taco, guac tostada, and a chicken taco, all served with rice and beans. Twisted Root Burger is located near the Ballpark and close to historic downtown, but people would be lining up for their burgers even if they were not as centrally located. If you have never tried a gourmet burger, you can discover it at the Twisted Root. They have beef, turkey, or veggie burgers, but the toppings make these burgers totally unique. The restaurant has a wide variety of cheese, from Danish blue to goat, many kinds of salsa like guacamole or pineapple, mushrooms, chilis, prosciutto, and, of course bacon. Be ready to eat your fill, and do not be ashamed if you cannot finish your meal. Be sure to leave some room for their famous adult shakes made with Baileys or Amaretto. The food is only half the fun; the other half comes from the fabulous décor that consists of a vintage Winnebago that serves as a bar, cooler benches, and various cars and motor parts. Tierra Verde Golf Club is one of those rare places where golf and nature live and work in harmony. 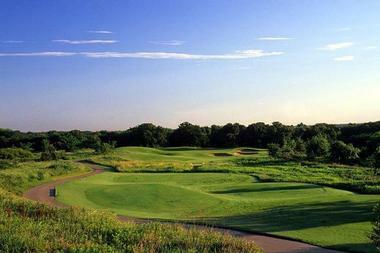 This award-winning golf course was the first in Texas to be certified as an Audubon Sanctuary. 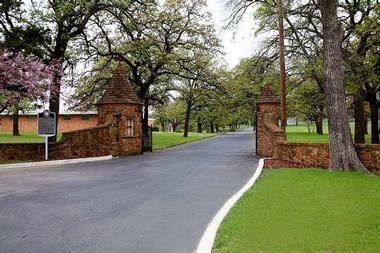 The course opened its doors in 1998, and it consists of 250 acres of lush, secluded land. Its unique layout includes a range of natural settings, offering an exceptional golf experience. Each hole features five sets of tees, strategically placed sand bunkers, sculpted fairways, and challenging water hazards. 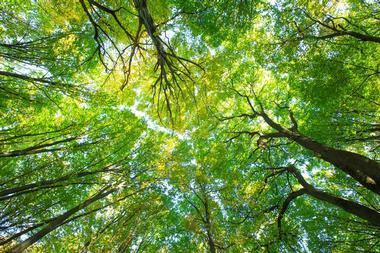 The area also features beautiful mature trees and verdant native grasses. Tierra Verde Golf Club includes a state-of-the-art learning center, a driving range that is lighted for night playing, a practice course with three holes, and a large putting and chipping green complex. You can take advantage of the club’s clinics, which are taught by certified PGA/LPGA professionals. After the game, celebrate your successes in the renowned Ventana Grille. Mimi’s cozy French Bistro style décor creates a inviting and pleasant whether you are taking out your new client or your mother-in-law. The food is new American with noticeable French touches, especially in the sauces. The sandwiches are excellent, and they are served on fresh croissants or brioches. Mimi’s has imaginative and flavorful salads, but their grilled chicken, steaks, salmon, and mussels are probably the most popular menu features. 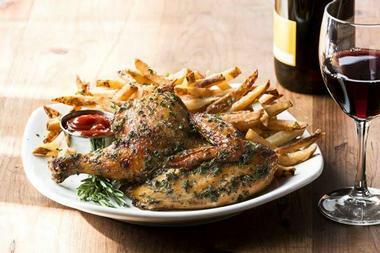 Served with their house-made butters with French spices and the choice cut of potatoes, these dishes are a wonderful combination of American and French cuisine. 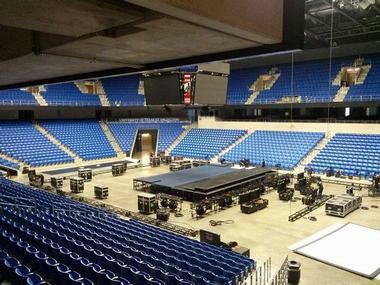 College Park Center is the first events arena at the University of Texas at Arlington. It is a spectacular space where you can come and cheer on your Mavericks. This modern facility hosts not only regular volleyball and basketball games, but also lectures, concerts, commencements, and many other exciting events. The Center can fit up to 6,750 guests for concerts and about 7,000 for court-based sport events. The Center also has a study area with a spacious study hall, group study room, computer lab, and offices for meetings between students and their academic advisors. The Center is just one part of the 20-acre College Park District that includes The Green at College Park, the College Park building, and the Dan Dipert University Welcome Center. Since its debut season in 2000 under the guidance of Maestro Robert Carter Austin, the Symphony Arlington has moved from the 200-seat Tarrant County College Roberson Theatre to its permanent home in the historic, elegant Arlington Music Hall in 2010. 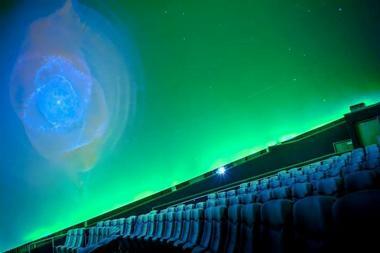 The grand old dame has been renovated and equipped with the latest sound and lighting equipment. The interior features sophisticated and classic décor. The orchestra is comprised of 93 talented professional musicians from 19 countries and a number of internationally acclaimed soloists. 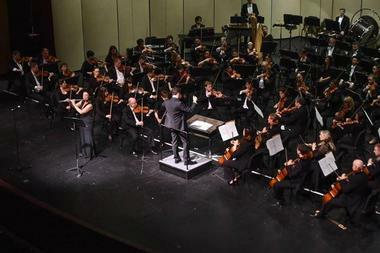 Check the symphony website to see what exciting events they have prepared for this season. Twisted Root Burger Co., Photo: Twisted Root Burger Co.